Potato (93%), Sunflower Oil, Milk Powder, Salt, Dextrose, Spices (Turmeric, Nutmeg, Pepper White), Onion Powder. Preheat oven to 210°C fan forced for 10 minutes. 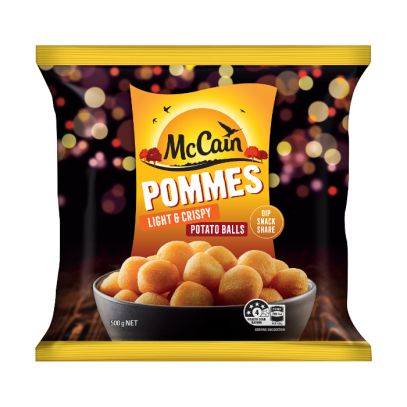 Spread McCain Pommes in a single layer on a baking paper lined tray and place in the top half of the oven. Bake in oven for 8 minutes, rotate and shake tray then continue heating a further 7 minutes until they are lovely and crisp. Regular turning is unnecessary.